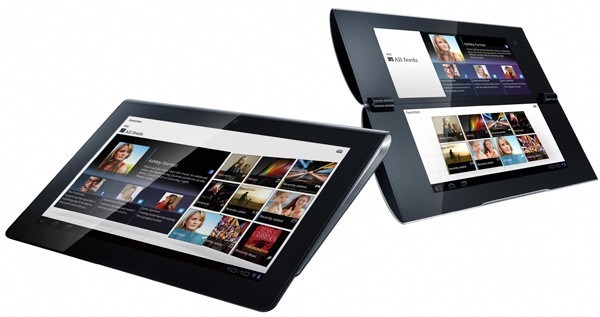 The S1 tablet is an Android 3.0 Honeycomb powered tablet that has a 9.7” screen running at 1280×800 resolution. It has a Dual-core Tegra 2 processor and is shaped like a magazine or a notebook rolled around the back. It has specific Sony embellishments like the custom browser and provisions to control other Sony devices. While the S2 is a Tegra 2 dual-core foldable book-type tablet with custom UI for dual-screen use. Each screen runs at 1024×480 to combine into a 1024×960 display top to bottom. Both are PlayStation Certified for use in their other digital gaming endeavors. Sadly, these tablets have been announced to feature the Qriocity online digital distribution platform, which we unfortunately must say, is getting bad publicity right now for it’s user accounts recently being compromised and still haven’t been resolved. It’ll probably be fine when these tablets arrive later this year, but bad publicity is sometimes pretty damning. Let’s hope for the best and for Sony’s efforts to curb the problems as well.